China Online, a new book by translator and multilingual netizen Véronique Michel, offers an exploration into China’s rapidly changing society and its flourishing internet environment. With the largest internet population in the world, China has a unique online culture. 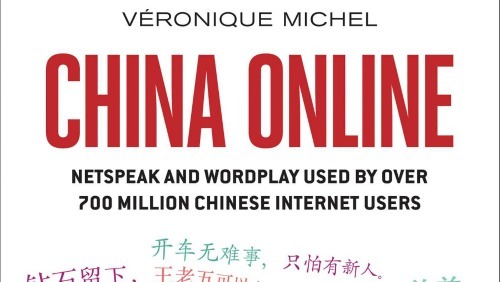 China Online, a new book by translator and multilingual netizen Véronique Michel, offers an exploration into China’s rapidly changing society and its flourishing internet environment, where new expressions emerge every day. Michels has written an accessible and entertaining introduction to China’s modern-day language and culture. Michels has divided her book in two parts. The first section, ‘Portraits’, uncovers how neologisms like “Mortgage Slaves” (房奴 fángnú ) or “Café Latte Tribe” (拿铁族 nátiě zú) identify different groups in China’s contemporary society. The drastic political and economic changes after the 1980s have led to a society where studying hard, finding a good job and spending money have become the essential strategies to survive. The “Ants Tribe” (蚁族 yǐzú), for example, refers to those who want to make their “wages fly” (让工资飞 ràng gōngzī fēi) in order to set up their homes and start a family in suburban China. In the second section, ‘Word Play’, Michel discusses myriad examples of creative Chinese expressions and what they reveal about today’s society. Many of them find their origins in news stories covered by Chinese media. “I’m going to buy some soy sauce” (dǎ jiàngyóu), for example, became a catchphrase after a journalist wanted to interview a passer-by, who then simply replied that he was off ‘to buy soy sauce’, which later became synonymous with “It’s none of my business” – a funny excuse for speakers who want to avoid voicing their opinion on complicated issues. Although China has some of the world’s tightest internet restrictions, censorship seems to be an elephant in the room in Michels’s book. China Online hardly gets political. It is the biggest downside to the book, since the country’s strong online censorship is one of the most important reasons why China has such a unique internet culture. It is also integral to popular online language, as humorous wordplay has become an important form of resistance against the censorship regime. Evading the political aspect, Michels misses an essential point in explaining netspeak and wordplay. China Online is easy to read, accessible, and offers a clear overview of new and classic online wordplay. As China’s online environment moves with incredible speed, any book on it will inescapably be outdated from the moment it is published. Popular expressions die out as quickly as they came up. But because Michels offers the cultural backgrounds to a range of expressions and catch phrases, it remains a relevant, no-nonsense and entertaining resource for anyone, amateur or expert, who wants to develop a deeper understanding of China and Chinese language today.